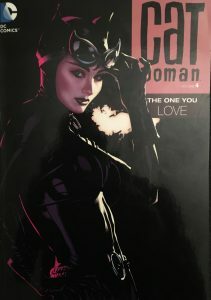 Catwoman, Volume 4: The One You Love is the fourth volume in the 3rd Catwoman solo run and the first collected edition following Brubaker’s exit after Under Pressure. 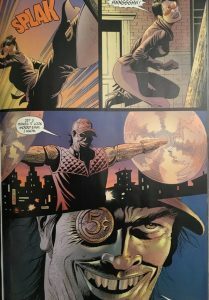 Will Pfeifer, Matteo Casali and Scott Morse take them helm as head writer as he continues Brubaker’s foundations and adding his own spin to it. At 240 pages, The One You Love is excellent value for money at around 15 for the book. Inside The One You Love are three stories which are still tied together – Three Piece Suit, Of Cats and Dogs and The One You Love. 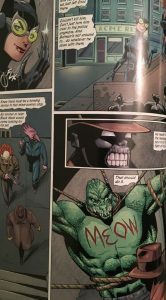 Three piece suit is a storyline involving a new villain called Wooden Nickel who is tracking Catwoman as ordered by a mystery gathering of Mafiosos. It mixes both detective and action together to create, what I found, to be a very fun storyline with the highlight being the very odd Wooden Nickel who has deadly wooden contraptions as arms. Old pal Slam Bradley helps out during all of this as Catwoman begins to try and tracking him down before ultimately coming down to an almighty showdown. Artwork in Three Piece Suit is of its time and if you’ve read anything during the War Games crossover then you will be very familiar. 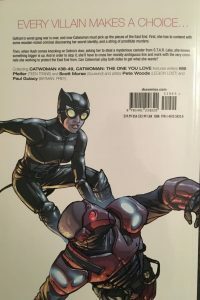 Although a bit of a pointless arc, Three Piece Suit is nevertheless a lot of fun to read with plenty of high powered Catwoman moments to appease any fan. 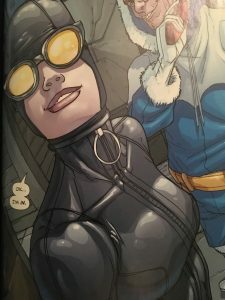 Of Cats and Dogs follows Three Piece Suit and is Matteo Casali’s (this book has a few writers) attempt at making Catwoman ‘gritty’ and ‘real’ by introducing a spree of prostitute murders as well as an illegal dog fighting ring which is centre to the plot. 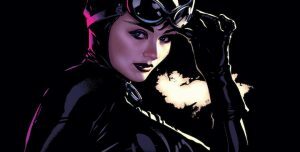 At times, it is a very good and tough read which does enforce Catwoman as a hero living in a dangerous but real world as opposed to Batman who many be known to deal with the more ‘crazy’ villain. It’s an OK arc but I feel Casali could have done a bit more by adding some plot twists along the way – because of the real lack of mystery it did seem like an arc that was gritty for the sake of being gritty with no real substance behind it. Artwork, once again, was of it’s time. Nothing too flash but overall has aged quite well. 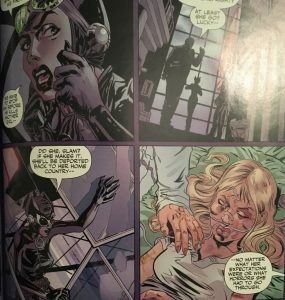 Catwoman: The One You Love is the titular arc written by Will Pfeifer and explores the East End and its troubles escalating even further to the point where it appeared to be a bit over the top and perhaps longer than it needed to be. However, The One You Love explores how people tend to always hurt the ones they shouldn’t, indirectly Catwoman has unleashed all manner of hell on the East End as villains (some super, some not) invade as they get wind that Batman is busy and Catwoman is the only protector. A strong premise which wasn’t brilliantly executed as the villains are pretty sub par and forgettable and the plot was very predictable as Catwoman teams up with villains with the aim to defeat them from within. There doesn’t seem to be much energy left in this arc as it has been pretty explosive in every storyline leading up to this one, perhaps a filler issue with bit less action could have given the reader a bit of a break before jumping right back into it. Angle Man, Captain Cold and Hammer & Sickle provide very little threat to Catwoman and serve more as comic relief and the appearance of Sam Jr isn’t explored enough which lets the book down as the invasion of East End could have been spectacular and sadly it wasn’t. Overall, at 240 pages and three arcs (with one one and done issues with Killer Croc and Onyx) makes this book a bargain read to be honest. Catwoman 2002-2008 is one of the best Catwoman collections out there and this one is pretty decent in the middle.